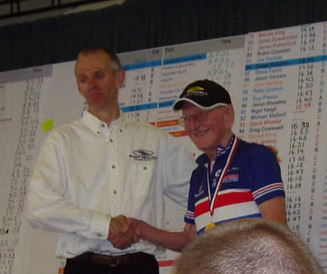 CONGRATULATIONS TO DEREK, this years (in July) VTTA 100 CHAMPION in a time of 4.47.15 and also (September) BRITISH TIME TRIAL CHAMPION in the 70+ age group. This follows on from his success in June when he won the "National 50" GOLD MEDAL (70+ age group) in a time of 2hr 03min 44sec. However, even more congratulations are due as this record breaking season isn't finished for Derek just yet...on Sunday 27th July he broke the VTTA 50 mile age record with a stunning time of 1-58-28. That's more than 25 mph!! !